Lightning isn’t just a startling light show in the sky. It’s a potentially dangerous natural phenomenon that has injured and killed many people over the years. Don’t let lightning strikes catch you off guard! Lightning dangers go beyond injuries and death to humans. Animals are also frequent lightning victims. Buildings can be severely damaged by lightning strikes, many times catching on fire. Forest fires are also often sparked by lightning bolts. In the United States, summer is the peak time for lightning. That’s because storms are most active and more people are outside then. So, how do you stay safe when lightning is crackling in the sky? Cumulonimbus clouds are the type that create lightning. From a distance, they look like tall stalks of cauliflower. These clouds are notorious for creating electrical storms. 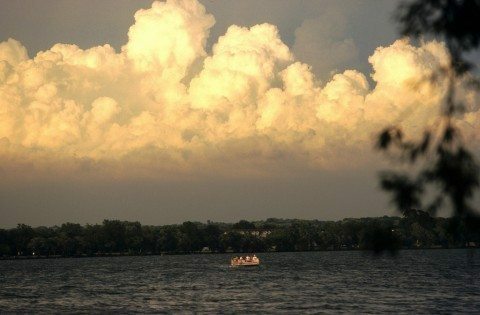 If you’re outdoors and see cumulonimbus clouds forming near you, it’s time to start seeking safe shelter! Keep your eyes to the sky, and whenever you see clouds darkening or building vertically in height, head indoors. The moment you see lightning in the sky — even if it appears to be far away — seek shelter immediately! An enclosed building, especially a metal building — Metal structures act as a shield of protection for those within. Ensure that doors and windows are closed. A metal, enclosed shipping container — Seek refuge in the kinds of shipping containers you see on ships and large trucks. Getting caught outdoors without any sign of shelter during a lightning storm is one of the most terrifying things a personal will experience. Unfortunately, thunderstorms can occur overhead or nearby with little or no warning. Stand under an overhanging roof or eave. If that’s not available, then crouch to the ground on your tiptoes and place your hands over your ears — like this. Stay as far away as possible from metal objects or tall structures, including trees, fences, posts, and flagpoles. If you’re stuck in a wooded area during a storm, crouch near the ground but stay away from taller trees — which are usually the first to be struck during a lightning storm. Do you know how long to stay indoors during a storm before going back outside? Probably much longer than you think. You should wait at least 30 minutes to return outdoors after you hear the last thunder clap. That gives the storm time to move away from your area or die out. Lightning has been known to strike several minutes apart, so don’t grow impatient. Again, wait the storm out for at least half an hour after the last rumble of thunder to ensure you’re safe from lightning. 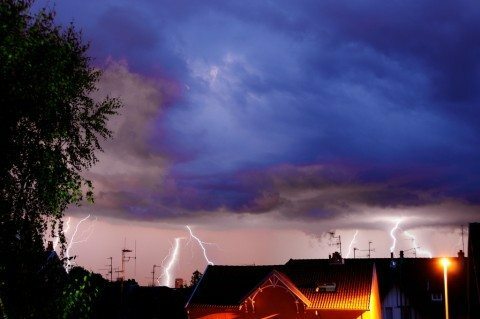 The advent of lightning detection technology has made it easy for virtually anybody to track stormy weather for miles around. Many golf courses and theme parks use lightning detection systems, helping to keep people safe by alerting whenever lightning is within a certain mileage range (usually 5 to 10 miles). Most lightning detectors on the market today are portable, handheld devices — which is ideal if you spend a lot of time outdoors. 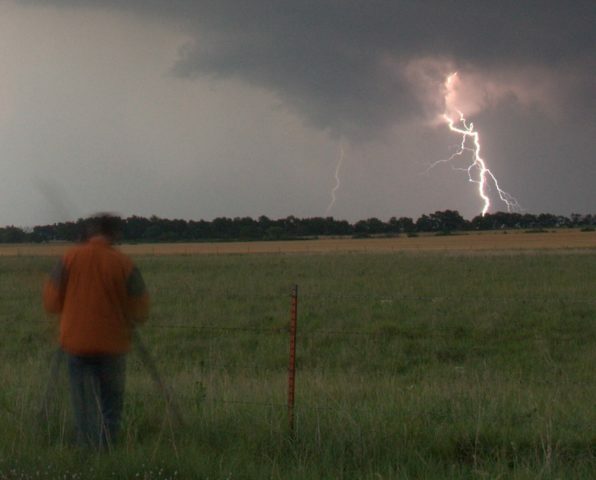 Most personal lightning detectors cost between $30 and $100. You can also use a FREE lightning map (or app!) to monitor lightning strikes near you. There are 25 million cloud-to-ground lightning strikes in the United States each year. There are 51 lightning-related deaths in the U.S. each year. About 10% of individuals struck by lightning die; virtually all others are left with temporary or permanent injuries. A lightning bolt can be as hot as 53,000 degrees Fahrenheit; the surface of the sun is a mere 10,300 degrees. There are approximately 100,000 thunderstorms in the United States during a typical year.